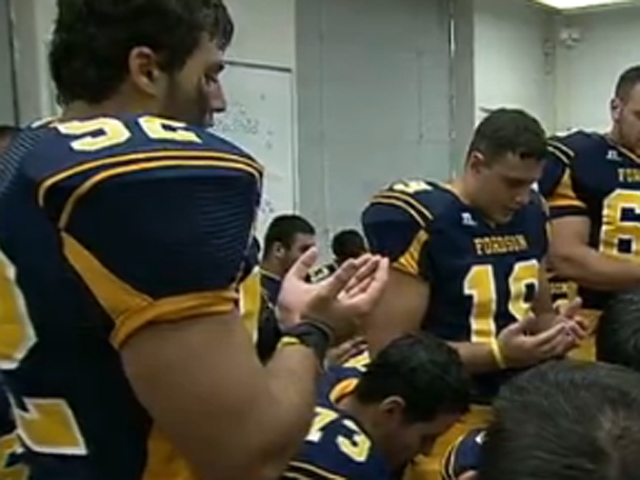 High school games kick off all over the country this weekend, including Dearborn, Mich., home of the largest Muslim population in the U.S.
One public high school football team there has changed its practice schedule to 12 a.m.-4 a.m. to accommodate Ramadan fasting. Muslims abstain from eating and drinking from sunrise to sunset during the month's holy days. As CBS News National Correspondent Jim Axelrod reported on "The Early Show," non-Muslim players and families haven't questioned the decision to change to overnight practices. Dearborn schools Superintendent Brian Whiston said, "We're following American laws, we're following board policy, state laws, and federal laws and, in meeting the needs of our constituency, it's no different than the Christian faith wanting certain days off from school because it's important to their holidays." Dearborn Mayor John B. O'Reilly told CBS News, "People will send me emails saying, 'What's going on in Dearborn, you're practicing Sharia law.' I'm like, 'No, we're practicing constitutional law, thank you.' ... If you're out there saying that Muslims in Dearborn are having Dearborn do things that are against America, there's just no evidence of it. In fact, the evidence is quite to the contrary." Click on the video above for the full report.